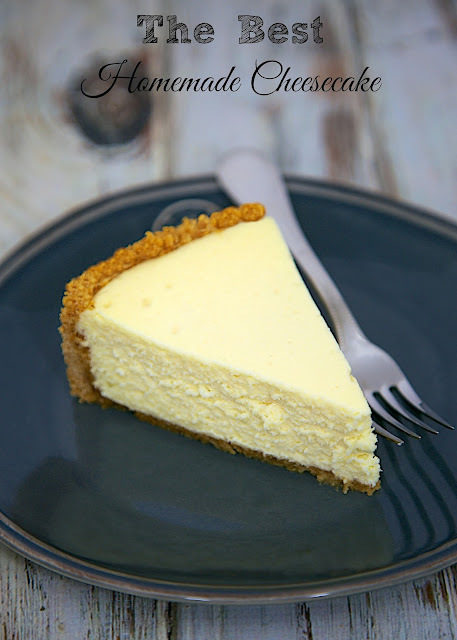 The Best Homemade Cheesecake - get the secret for the lightest and fluffiest cheesecake ever! I've been making this cheesecake for years. The recipe came from a parent when my Mom taught school. This is truly The Best Homemade Cheesecake recipe on the planet! Chicken Legs says this is the best dessert that I make. He said other desserts are good, but this is the best! What makes it so great? It is super light and fluffy. How does it get that way? The egg yolks are beaten in with the cream cheese and then the whipped egg whites are folded into the batter. That makes all the difference. I took this cheesecake down to my parent's house for Christmas. I hadn't made it in a long time, and I won't be waiting so long to make it again. It tastes amazing! The cheesecake can be made ahead of time and frozen until you are ready to serve it. I love plain, un-topped cheesecake and this looks very good from here. Looks great! Did you use a water bath for the cheesecake? I did not. I cooked it exactly as I wrote above. I loved it! I did it without freezing it, just refrigerated it for the day, we ate it that night! I do out the cheesecake in the freezer while it is slightly warm. I have always frozen it, so I think it is required. You can eat it without freezing and see how it goes. I can't make any promises since I've never done it that way. Oh I must try this! Cheesecake is my favorite dessert - with strawberries on top :) I love that you can freeze it and have it on hand or ready for the holidays. I've made the Cook's Illustrated cheesecake and it was perfect, but this sounds a lot easier. Dear Steph, That is a beautiful looking cheesecake and I bet it is delicious!! I do love cheesecake. I've only recently realised that all the recipes that I had placed in my zip list are forever gone! What a disaster....and pinterest is too much. I tried it and forget it! So good luck with that.......they might just do a zip/zip too. Hi Steph. I have never made a cheesecake before and I am not a fan of lemon. Can I make this without the lemon juice? It doesn't have a lemon flavor at all. I've never made it without the lemon juice, but you can certainly try it. Sorry, if I post twice...lost my preview on log in. Beyond "light and fluffy"...is this cake dry and crumbly or smooth and creamy? Smooth & creamy (just slimy, to me) seems to be the preference these days, and I can never find a recipe to make the older, dry style. I don't like those cheesecakes that feel like I'm eating a stick of butter either. This is creamy, but not slimy. So happy to have come across the recipe. Can we use other pan than springfoam type? Hi! Could you tell me please how many grams of graham cracker crumbs, butter and cream cheese? Wow, this looks fabulous! I love the plain look of it, but there's nothing plain about it! Mmmmmm!! what kind of graham crackers did u use? is honey flavor ok? I've used honey graham with cinnamon in another similar recipe. It was no problem at all. do you hv any photo to show the egg white became stiff and creamy? Or how long do we need to beat? This looks very good. I have it in the oven right now. How long before serving do you take the cheesecake out of the freezer? I've never tried this with Splenda - I don't bake with Splenda, so I am not sure how it would turn out. Use the Baking Splenda. I really do not like the melting stuff, bleah... The baking splenda does have sugar, but not as much. Hey, it looks like sugar, so...it does hae a better taste and it is made for baking. I did use this when my hubs was sick. Prednesone made his sgar skyrocket. Use the Baking Splenda, it's the granulated kind. It is really good. Half the sugar, still has some, but much better than the "melty" stuff. Tried it in cheese cakes. Good. How do you remove it from the pan if it is a graham cracker crust? And after eating, do you put it back in the freezer or the fridge? I store it in the fridge after serving. Wonderful flavor! I tried making as "mini" cheesecakes; but although I followed the recipe to the letter; every single one of them fell in the center - I had to improvise and fill in with fruit topping n chocolate swirls. They tasted wonderful but the "look" was very disapointing. What did I do wrong? Hi Stephanie! Is it possible to make it without the crust? Would the baking time and everything be the same? Hi Stephanie! Have you tried doing this without a crust? Would the baking time and instructions be the same? It's for my brothers birthday and he loves cheesecake but not so much the crust! I've never made with without the crust, so I don't really know how it will bake without it. I would assume it would bake the same amount of time, but I've never tried it. I just finished baking this and it still seems a bit jiggly.....does freezing it fully set it?? It shouldn't be super jiggly. Did you leave it in the oven for an hour? Yes I baked it for 35min and let it set in the oven with the door closed for 1 hour. It has been in the freezer for two hours and it seems set now so I'm hoping when we cut it tomorrow it is cooked through. Fingers crossed! :-) It looks yummy! I just took mine out of the oven and it has a brown lifted Shell around it. What did I do wrong? I've never had that happen in all the times I've made this cheesecake. I'm not sure what happened. Sorry! Would high altitude affect the baking in any way? How should I adjust? A few hours before serving should be fine. I usually take it out the morning that I am serving it and refrigerate it until we eat. This is wonderful! I made it a month ago to raving family members, and now am taking it tomorrow to school for our faculty dessert. Thank you! hi! can I add i lil bit of gelatin and not bake it in the oven? what do you use to cut your cheesecake ? I use a sharp knife. 3 packages of 8-oz cream cheese. Enjoy! I think 35 minutes was too much to mine. It became a little brown on top. Waiting the last one hour of oven and the others five hours of freeze to try!!! At least, it smeels very good! Thanks for share. This happened to me once . I had UT too close to the oven rack top. How long can I leave it in the freezer before serving ? and how long does it take to thaw ? It should keep in the freezer up to a month. It will take several hours to thaw. I usually leave it in the fridge all day and it is thawed by the evening. This recipe is awesome. I made it for a family dinner and my father in law asked for the leftovers to be left for him. I followed it exactly and was a little nervous because I never baked a cheese cake before. It was perfect and everyone loved it. I topped it with a strawberry glaze made from jam. Thanks for this. Will be making it again, soon. 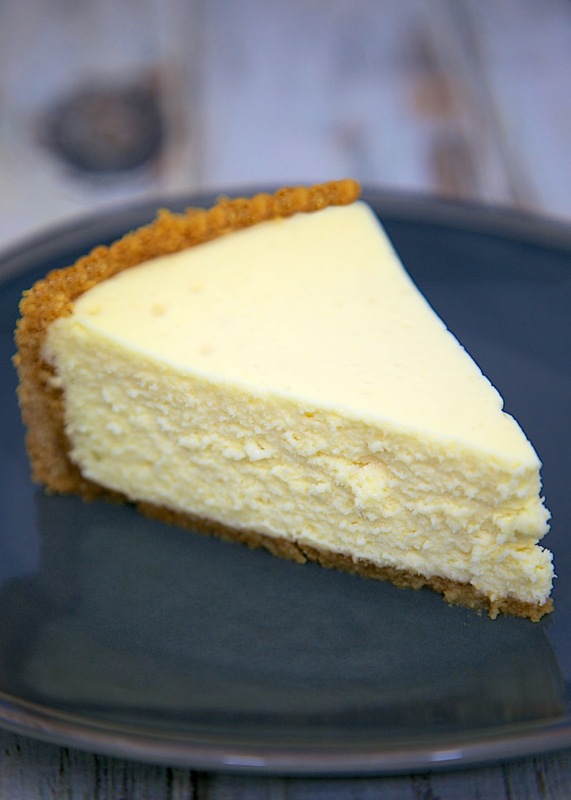 I love cheesecake and this looks so simple! Definitely gonna try this! Hi! Any substitution for sugar? Well I made this cheesecake last night. Actually, I was searching for a good recipe to top off some brownies so I used this as my cheesecake layer for a 9x13" pan. I was happy to find the recipe came out to equal twice as much cheesecake as there was brownie. I am pregnant and have become very picky about my brownie to cheesecake ratio. However, my only complaint is when I pulled them out this morning to be cut up, I ended up ingesting somewhere upwards of 1,000 calories in cheesecake alone before I had even touched my first cup of coffee. This left me with heartburn and that unique sense of diet failure. I immediately cut up what was left into bars and threw them into a storage container in the freezer, hoping nobody would notice a quarter of the pan was somehow missing. We all know the pregnant lady is an immediate suspect. But I have a feeling once they get a taste I will have their complete understanding. The cheesecake was fluffy and creamy without being too dense. I did keep a pan of water on the bottom rack during baking and didn't end up having any cracks. I'm excited to give this recipe a try in an actual cheesecake pan! The fact that it is such an easy recipe is probably not a good thing. I have a love/hate relationship with super yummy things where the ingredients come together in less than 20 minutes. But regardless, now that I have it, I will certainly be making it again soon! Also, to address the "cracking" issue. The best thing I have found to prevent cracking with cheesecake is to keep the oven closed as to avoid temp changes. Keep the light on and give the door a jiggle or open ever so slightly and allow it to kind of slam closed to test the "wobbly" factor of the cake. When it looks right, just turn the oven off and leave it. Keep a water bath under it and allow it to cool for at least 2 hours in the oven before opening the door. I really loved your recipe. I made this cheesecake last night it is very simple, but yet very tasty. Since I couldn't try it last night I had to have it for breakfast. Definitely I'll keep this recipe handy for when I get friends coming over the house. Thank you so much for sharing it. Hi! At what temperature do you have to bake the cheese cake for 35 minutes? Can you use a 10 in pan instead? If so how long would you bake it? This is by far the best cheesecake I've ever had. I made it last night for dessert today. Absolutely delicious! Has anyone ever used a pre made graham cracker crust? I disn't have any graham crackers but has thowse. It made 2 and it is resting in the oven now. So we shall see. Do I need to allow it to cool before I place it in the freezer? Should I cover it with something before I place it in the freezer also ? I cover it with plastic wrap and aluminum foil. I do let it cool before freeze. Is it just me, or does this recipe make more than fits into one pan? My 9.5 inch glass pan definitely doesn't whole the entire mix. The recipe is not for a pie plate. It is made to go in a springform pan. They are not the same. I love this cake and have made it several times. Have you ever done a chocolate version? I need to make a chocolate cheesecake and don't wanna do the whole water bath thing. I just don't want to add the chocolate if it will compromise the texture and lightness. Have you ever tried it? Recipe came out great! First set of eggs white WOULD NOT get firm so I had to redo that step but the cheesecake came out great and tastes great as well! I cooked it for 35 mins as suggested then let it sit in the oven for an hour. I did not use a water bath although I saw many comments where it was suggested and the cheesecake still came out beautifully. So glad you enjoyed it!!! A water bath is totally unnecessary for this recipe. It never fails me! are we using 8 eggs in total? can you use this recipe for mini cheesecakes? I'm sure you could. You will have to play with the cooking time. Does brown sugar work for the crust? I have not made the crust with brown sugar, but it should be fine. can you use a regular circular cake pan for this instead of springfoam? I've only made this in a springform pan. I don't think a cake pan would be deep enough and it will be harder to get out of the pan. Does it matter if the butter is salted or unsalted? No - I always use unsalted, but salted is fine in this recipe. Enjoy! Do you have to use a springform pan? I've only made this recipe in a springform pan. You can try lining a cake pan with foil and baking it in that. You might have some leftover filling. I’ve made this over and over, and it turns out perfectly each time!!! Thank you for an amazing cheesecake recipe!!! We love it!!! So glad you and your family enjoy the recipe! Help!My cheesecake has sunk in the middle! Why? I did everything according to instructions. Maybe I should have mixed all the ingredients together at the same time rather then creaming the egg yolks and sugar and then adding everything else....I would be really happy if I got your reply.Thank you! I’ve never had an issue with the cheesecake sinking. I’m not sure why that happened. I make the cheesecake exactly as written and never have any issues. It turns out just like the photo. Mine cracked big time down the center. Is that normal? I didn't everything exactly how it said to. In all the times I’ve made the cheesecake, I’ve never had it crack. It could just be the differences in ovens. Not sure. Sorry! I love this recipe! Cheesecake is my husband's favorite so I needed this. I just made it and put it in the freezer. How long can I leave it in the freezer? I was going to have guest come over tomorrow night, but plans got changed to the day after tomorrow. It will keep several weeks or up to a month in the freezer. You are good. Enjoy! I thoroughly enjoyed this cheesecake. I messed up and put 1 tbs instead of 1 tsp of vanilla but it was still really good! Everyone loved it! I had made this recipe twice came out wonderful and we loved it. Making it again for my sons birthday and today baked for the 35 min @325 and then let sit in the oven for an hour. And when took it out it was still super jiggly in the middle and could tell it was not done. Put back in the over @325 for 15 min and rest in the oven again seems better but the top is now a little over done. Ever had that happen? Have you ever checked the cheesecake to make sure it is done at the 35 min mark to know if it needs to bake more? Is this 3 x 8oz cream cheese or 8 oz total? could you bake 2 at a time or do you think it would just be best to stick with 1? I’ve never made 2 at one time. You can try it. Maybe add 10 minutes to the cooking time. I removed it after letting it rest for the hour and it still feels very jiggly and not done from the center. Will the freezing period fix that? Has anyone tried baking this in a convection oven and if so, at what temperature? Hi, I've made this before and it's delicious. My family didn't want to wait and we dug in without freezing it. I want to try it again the right way and freeze it. Since it was a bit too soft the first time. My question is, do you freeze it in the springform pan? Any problems or tips from keeping it to stick? I made this, and my husband who doesn't like cheesecake said that he liked this one. The only thing I did different was pre-bake my crust so it wouldn't fall apart and added parchment paper to my pan. Mine did crack down the middle, so I wonder if it was because the crust was warm from pre-baking. I'll bake everything all at once next time. Thanks for the yummy recipe! I made this cheesecake a few months ago. I followed your recipe to the T, omg!!! It was the best cheesecake ever! I'm been thinking about it every since. I finally got all the ingredients to make it again . I'm soooo excited to make it again . Thanks for sharing this awesome recipe!!! This cheesecake is AMAZING! I absolutely love it and so does everyone who tries it - and they usually ask me for the recipe! Question - mine cracks every, single, time after I get it out of the oven to cool before I put in the freezer. I am following the recipe to the T. Any suggestions on keeping it from cracking. This last time I beat the egg whites even more and it cracked a little less but still cracked. Thoughts? I LOVE LOVE LOVE this cheesecake recipe!!! Since Halloween, I’ve made this cheesecake THREE TIMES!! The first time, for a Halloween potluck, my coworkers knew they were all my test bunnies. And since I’ve made others over the years, they were all willing. I was doubtful, trying something new and all. I needed their honest so that I could fix whatever needed. Well, the cheesecake was brought to the dessert table at 11ish. It was gone.. GONE by 2:30!!! I even shared your recipe with two... THREE other coworkers. THIS is by far my favorite cheesecake. As for my third one, it’s for my Mom’s birthday on Christmas Eve. I wanted to be sure I had that ready for her for her special day. Thank you for sharing the BEST CHEESECAKE ever recipe. Would it be a problem if i used oreo cookies for the crust? I wouldn’t think so. Sounds delicious!